As much as I love dining at Fresh restaurant, trying new-to-me vegan restaurants is one of my favourite things to do, especially if it is close by. 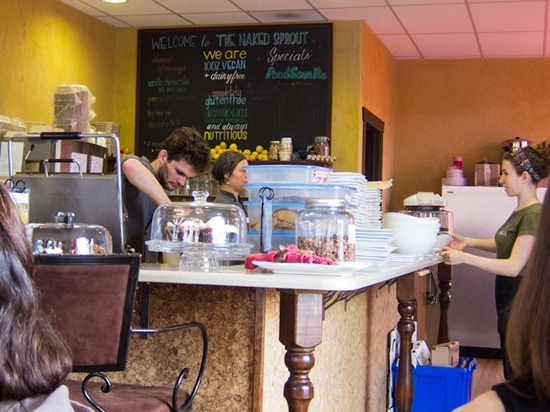 Enter The Naked Sprout – Burlington’s (mostly) organic, raw & cooked, vegan, and gluten-free restaurant. It’s a 15 minute drive from me, making it the closest vegan restaurant in my area. My friend Heather took me here for my birthday a few weeks ago and I was excited to try it out after listening to her (and many of you) rave about it. Heather and I met through my Glo Bars a couple years ago. She was a regular customer and visitor to my stand at the Farmer’s Market in Oakville. We stayed in touch through email and when I moved to Oakville (where she also lives) I suggested we meet up. It’s been a lovely friendship ever since. 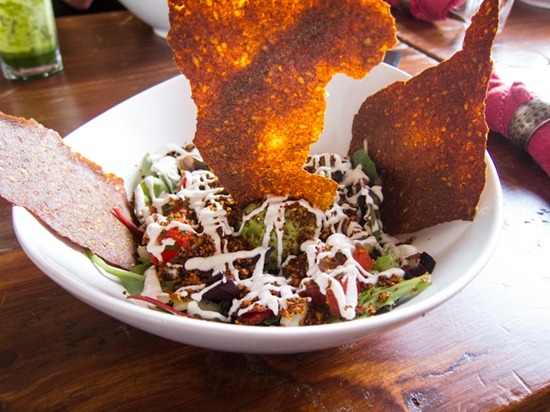 Here’s what intrigues me about The Naked Sprout: they offer raw and cooked vegan meals, reflecting how the owners eat in their everyday lives. 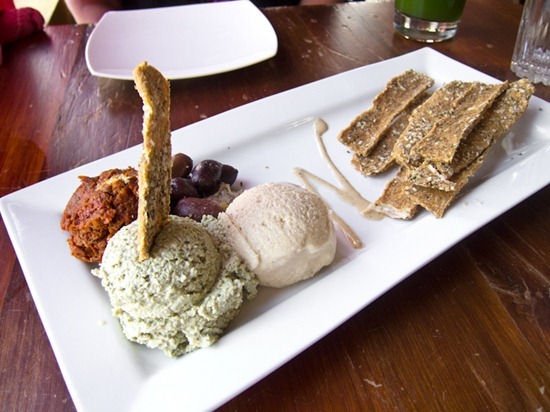 I enjoy raw food quite a bit, but I also love my cooked food and was happy to see this flexibility on their menu. Oddly enough, my first two meals here were raw. 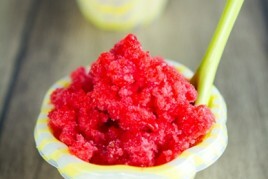 I guess I can thank the summer heat for dictating what I crave! 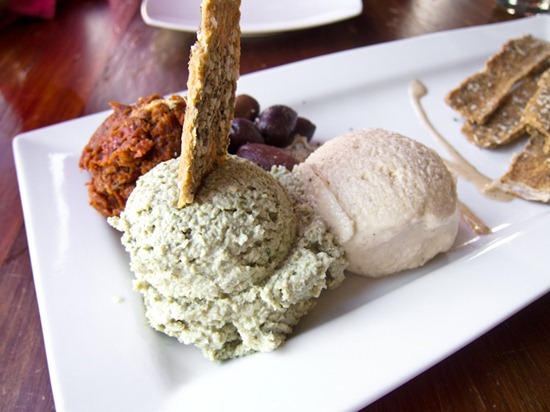 For an appetizer, we shared the Skinny Dip Platter made up of parsnip hemp thyme bread sticks, lemon dill pate, creamy garlic hummus, spiced olives, sun dried tomato tapenade. It was excellent and so flavourful. I need to figure out how to make those raw bread sticks stat. For my main, I ordered the Big Green Earth Salad. tomatoes, shredded beets, avocado, tempeh. I got it without tempeh because I’m not a fan. The salad was great…filling and delicious! The restaurant is quite spacious and they take reservations (bonus! ), so I figured it would be a fun spot for a get together. I emailed the running group (the one I started to organize prior to my knee injury) to see if anyone wanted to join me and about 10 of us made it out. I was excited….and scared all at the same time! I always get extremely anxious before these types of things, but as always, I had a great time and everyone was super friendly. When will my anxiety ever learn? A group shot: Natalie, Julie, Jennifer, Char, Ange, Vanessa, Rachel, Daniela, and Chelsea. I started with the Green Scene juice made up of Cucumber, cilantro, kale, celery, romaine, lemon. 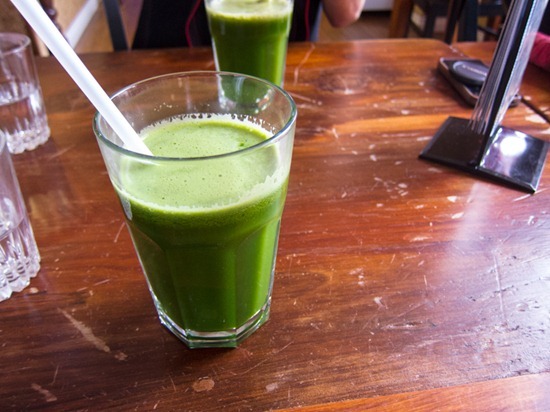 It looked green and it tasted green…just the way I like it! For my entree, I ordered the taco salad. 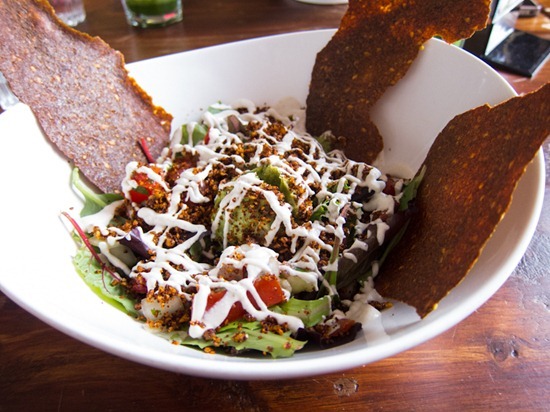 The base is a bed of mixed greens, with a huge scoop of guacamole in the middle, salsa fresco, sprinkled with sunflower taco meat all topped off with cashew sour cream. It comes with a salad dressing, but I didn’t find it necessary. It was flavourful and quite dense without being heavy. 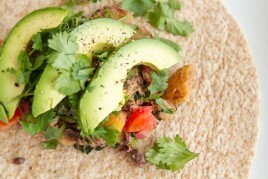 Keep your eyes peeled for a Naked Sprout inspired taco salad recipe coming up! 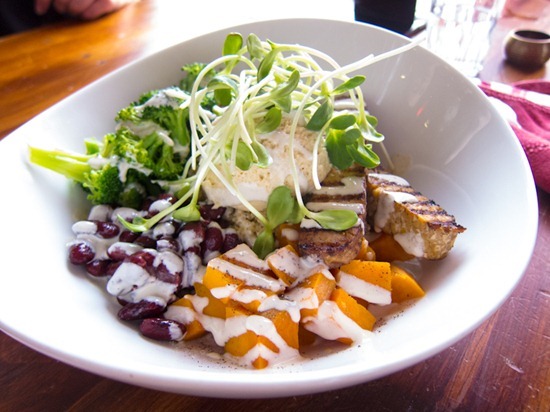 and the Protein Power Bowl was a hit too. For dessert, Vegan Cupcakes via Kind restaurant in Burlington were quite popular at our table! This chocolate peppermint tastes just like Grasshopper pie. Yum. and I heard the Chocolate Coconut was amazing too. The rest of the weekend was spent working on a to-do list: mountains of laundry, recipe testing, cleaning, and eating watermelon. Lots and lots of watermelon. I also went on a couple runs and enjoyed some evening walks with the hubby. The weather was amazing on Sunday…sunny and 30C! Pinch me. If you are in the area and would like to be put on the email list for future meet ups, let me know below. I’m also starting a running group that will meet on Sunday mornings in different places around the city. The first one kicks off next Sunday, so if you are up for it, let me know in the comments and I’ll add ya! Eric and I also want to get into sailing. How does one go about sailing without a boat? If any of you might know how to get started sailing in Oakville or if you know anyone who is looking for help, we’d appreciate the tips. Well, I have no idea about the sailing, sorry! :( Where I live you can rent canoes and kayaks though to go down the rivers… I need to do that sometime! I’m would love to be part of the meet ups and running groups! My boyfriend is also a big sailing nut and we’re in the area too. Drop us a line and we can connect! Can’t wait to try the Nake Sprout too – I’ve heard great things about it. Awesome, will do & chat with you soon! All of this food looks AMAZING! I am so jealous we don’t have any restaurants like this where I live! I will definitely be looking for that taco salad recipe, sounds yummy!!!! I know that was so much fun!! We have to do it again :) I cna’t believe it was 2 years ago now. Any plans to come this way this summer? I wish! My hubby is on the middle of interviews for college positions so we could be anywhere by the end of July or in August. eek! Please send him my best wishes! Im sure it will all work out for you. That looks like a great restauarant and can’t wait for the taco salad recipe! We’re renting a place in MI and some offered a boat with rentals. I would be so afraid I’d crash it. I hear they have classes and such for those wanting to learn. Might not be a bad thing even if it’s only for info purposes! LOVE LOVE LOVE Naked Sprout! Twisted Tacos and the Zucchini Pasta are my fav! For sailing my boyfriend is really into it and has a small 2 man boat that he takes out. He is always looking to take people out and introduce them to the sport. He’s also a member at the Sailing Club and LOVES it! If you are really interested you can become members at many of the learn to sail programs. p.s- I have one of Carol Alt’s books for Raw Foods— LOVE it! Hey Laura, Thank you for all the great info! I will drop you a line soon! Wow, The Naked Sprout sounds really great. The protein bowl looks so yummy, everything in it seems like it would go together perfectly…but the cupcakes looks mouthwatering! I think I may venture out there. I like how you did a restaurant review, I actually did my first one last night on a place called The Organic Oven! I can’t wait until you figure out the raw breadstick recipe too! They look delicious and nutritious my favorite. I’d love to do a meet up! Please add me to the list.. 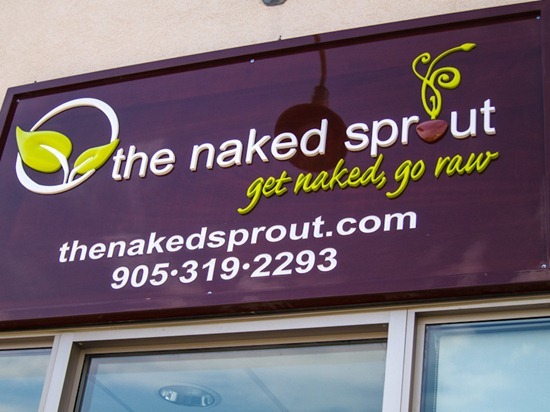 I have been dying to try the Naked Sprout.. had a sample at the Niagara Veg Fest a few weeks ago. Love KIND FOOD! The Red Velvet cupcake is made with beets and is delish. 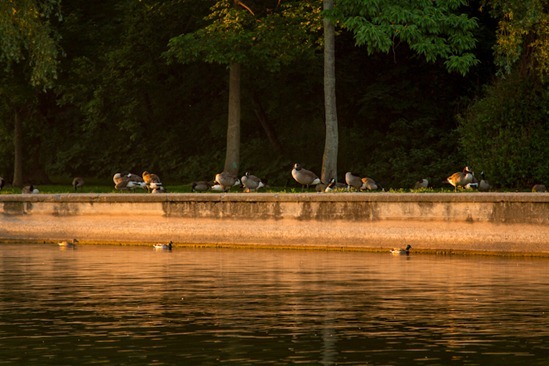 Hubby and I walked along the lake on Sunday night and just sat and chatted for hours.. gotta love living by the lake! Adding you now :) Thanks Karen. Ah I wondered what the red velvet was made with..that’s such a great idea to use beets! While I love living in Charleston, SC, I am quite jealous of all of the great restaurants that surround you!! I live in the ‘biscuit, bacon fat, cheese, bbq’ capital and it is so hard to eat out. Anymore, Kevin & I stay in and cook from all of the fresh produce from our garden/farmers market/ csa. Im a big fan of the Naked Sprout…have been going since they opened. I haven’t been in a while and really need to get there and try their brunch menu which looks amazing. Would love to be added to added to your list for future meet-ups/running groups. I live in Milton but work in Oakville so can probably make it out from time to time. I’m a huge fan of Naked Sprout….and I live in the area. I would love to be added to your list for future meet-ups/running groups. Is anyone in the running group training for any races coming up? Yes, I think there are :) I will add you! I have a friend who built his sail boat when he first got into sailing. He recently sold the boat but when he had it he put many hours into sailing it. The boat was 29ft and made entirely of wood. I know Eric enjoys building so maybe you two can build a boat together. My friend built his in a tiny apartment garage with his triplets while working as an RN so I KNOW you and Eric can do this at your place. If you are interested I am sure he would not mind giving you the details. Wow, that is quite the undertaking indeed!! That link didn’t work for me unfortunately. I imagine it’s spectacular though. Can I email you the picture? Ohh how I wish I lived on that side of the city!! (I’m in Clarington – at the far east end of the gta) The Naked Sprout looks fantastic! Thanks Heather! I will check it out. :) Hope to see you this week! 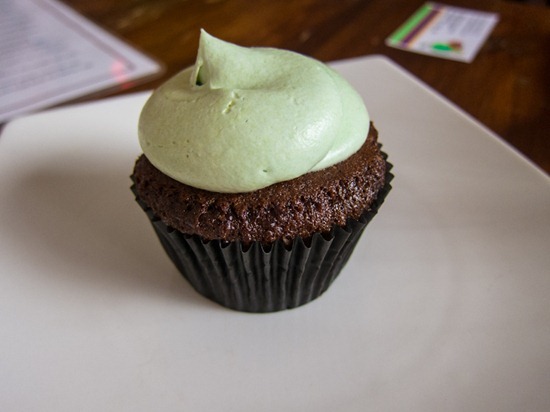 That minty green cupcake looks amazing! How fun!! It sounds like an amazing restaurant! The presentation on the raw tacos is incredible! and those cupcakes look delicious! thanks for sharing! Those raw tacos look just amazing! Looks like a super fun place to hang out and eat! Thanks for sharing! Everything looks delicious — and has inspired me to make some cupcakes later this week! 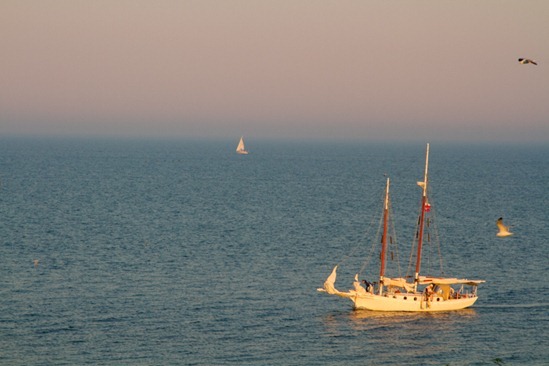 Hmmm…when my friend wants to go sailing, she starts to date a guy who owns a sailboat. I wouldn’t recommend that option to you though. Haha. All of this food looks delicious. You are so lucky to have a restaurant like this so close to home! That restaurant looks amazing! I just wanted to let you know that your “perfect veggie burger recipe” has been on my must make list for a long time and I finally made it last night. My roommate literally high-fived me after trying one. I’d say that’s another Oh She Glows recipe winner. Can’t wait to enjoy one on top of a salad for lunch (still going strong with the June salad challenge!) Keep the great ideas coming! haha love the high five :) So glad you both enjoyed it! Thanks Diana :) It’s GREAT on top of a salad! I wish there were more restaurants like that in my area. I live on the Iowa/Nebraska border, and these people LOVE their steaks. I’m not vegan or vegetarian, but I love having different options, especially when they look as amazing as the foods you’re showing. Well, I’ve officially drooled all over my keyboard now! I love trying out new veggie places, too. Especially those that serve big bowls of healthy veg. Everything here looks awesome! It was great to meet so many amazing women and to reconnect with you Ange! I would love meet-up again, although I’m not ready for the running meet-up. I’m always open for a walking group though. Or a picnic and a walk …. so many fun ideas for the summer! Looks like there’s lots of fun to be had in your new city, with lots of like minded friends around. Awesome, creative meals there too! 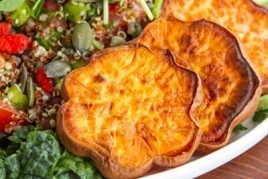 I just moved to burlington and have been wanting to scout out some yummy vegetarian/vegan places (dbf often has very different views on places that look good). I know where I’m going on Saturday for lunch! Oh gosh i need to get to a vegan restaurant asap! The pictures look sooo good! There are none in the area but when I go travelling i’ll definitely look some up! :) I love what your doing with the group jogs, wish i could join you guys! The look of all the food you posted. Your recent trip to Scottsdale at Dr. Weil’s restaurant had me really wanting to go there (as I am in Tucson). It’s really interesting to see the unique dishes people can come up with! Especially raw ones! I look forward to your adventures, and your photographs. Eating Vegan is a Beautiful thing. It’s nice new places are opening up for us. I eat most meals at home, so I know what a treat it is to dine out AND have amazing choices. We are Blessed!! What a great looking menu and even better, what an awesome meetup. 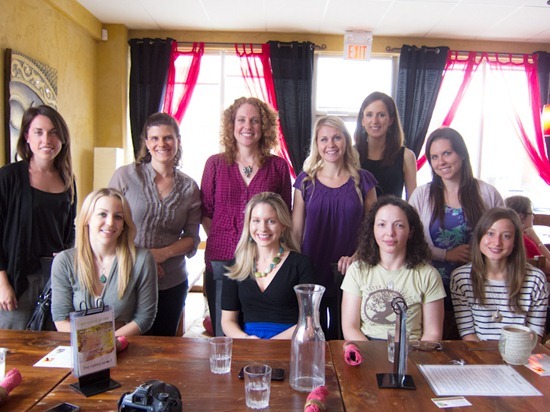 So many of you awesome ladies in one place and there is nothing better than connecting with others who share the same passion for blogging and food and being able to chat in person about it all and life. I love meetups like those! Awesome menu, awesome meetup – what more could you want? I’d love to be in the next meet up! I just added you, thanks! Definitely add me to the list – it has been far too long since our last meet-up. Definitely I would LOVE to see you! That restaurant looks fantastic! My dad has a baseball tournament up that way near the end of the Summer so I will have to check it out!! That place looks great, can’t wait to try it next time I am in the Burlington area! 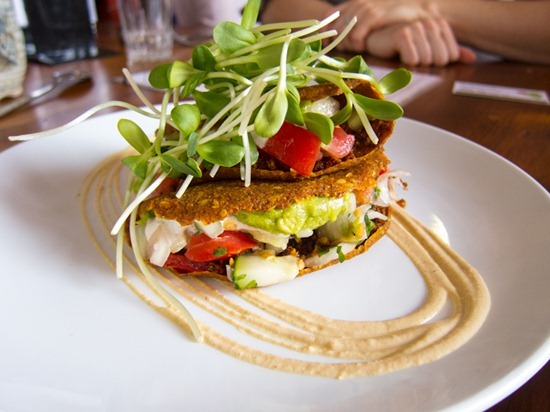 By the way, there is a great raw restaurant in Port Credit called ‘Raw Aura’. Sounds similar to the Naked Sprout and worth checking out. They have a avocado tartar dish that is amazing! I’ve been to raw Aura and it was great! Have you had their cashew kale chips? omgggg. I would love to be added to your list for a future meet up. I live in the area, and while I frequent Kind Food (ALOT), I’ve always wanted to try the Naked Sprout. Thanks for the review and pics! Awesome, I just added you Melanie. Social anxiety is not fun, but I think good experiences like this one make it a tas easier the next time around! That place looks really fresh and tasty! I love checking out new vegan spots nearby. I especially like discovering new ones I never knew of. Wish I could come to one of those meetups, but I’m all the way in Chicago! 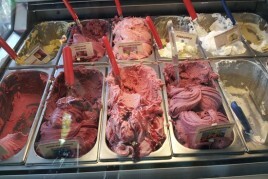 mmm you just reminded me of Karyn’s on Green… :) Almost worth the trip just for that food! I haven’t tried that Jaime, but that does sound good! You are welcome here anytime Char! Count me in for a meet-up! :) I’m often in the Oakville area and would love to try out some new places. I live in Mississauga (or at least I will be living back in Mississauga when I finish school in less than 2 weeks) and would love to be part of a meetup group and running group! I was just thinking about how I wish I had people to run with – I was thinking of joining the Running Room for some of their runs, but this works too! thanks Christie, I just added you to the list. Hope to meet you soon! Hi Angela! That restaurant looks amazing! I love the presentation of the foods – they all look so yummy. I would love to be on the email list, i just started running this year and am in love. Also I want to thank you for letting me know about the PC organics almond milk – tastes identical to Blue Diamond, and is the same price. I have been trying out many different kinds, and some of them just don’t do it for me. I’m glad you love the PC almond milk…it’s my new go-to and I LOVE that it’s organic and the same price. Hard to say no! Wow, that looks like a fabulous restaurant! 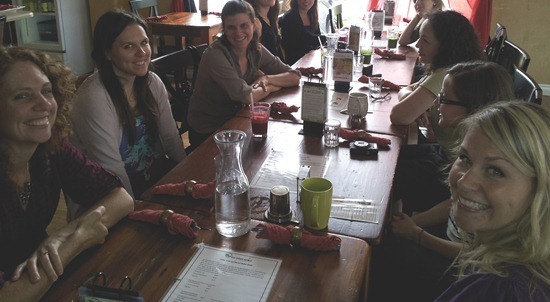 Thanks again for organizing that lunch Angela – I had such a great time! Also the two meals you’ve eaten there both look amazing. I want to give that Big Green Earth salad a try next time I’m there. It’s too bad you don’t like tempeh though since they use so much of it. I noticed they don’t really use tofu – I wonder why? I noticed that too about tempeh….I wonder why. I should ask them next time. I wonder if it’s possible to sub in tofu for some dishes? I need a place like that in my life – all of that food looks and sounds so great – tasty AND nourishing. You got a great group out too! I looove your site and your story is so inspiring! I struggle with some of the same things you did, but I’m getting better every day :) I was wondering if you’ve ever done/would consider doing a talk/speech of some kind. I know so many people who love your site and would love to hear your journey into veganism and your story. Yes I would love to do that at some point in the future! I actually want to do a toastmasters thing to get me comfortable with public speaking again. I hear they are great! I went there recently and LOVED it. My family made it a stop on the way back to my university after a bit of a struggle convincing my parents to try vegan food for the first time. This restaurant turned my very skeptical father into a lover of vegan food. He’s actually been experimenting with it quite a bit! I strongly recommend the Reuben, the tacos, and the key lime pie for dessert. Delicious! I am not a runner, but I would love to do a meet up! I just relocated to Toronto from Saint John NB about 2 weeks ago and would love the opportunity to network. The first week I arrived I went straight to Fresh on Bloor, then to Freesen, and Live Organic Food Restaurants. While I was at Fresh I got my hands on a Vegetarian directory. I am a Raw/Vegan and ever since I read about it in the directory I have wanted to try the Naked Sprout. I was very excited to see the pics you posted from there – thank you! That must have been a big move!!!! I moved from Riverview NB to Milton ON and I found it a huge change! How are you liking it? I went to university with Natalie – small world!! Awesome, I would love to see ya soon! 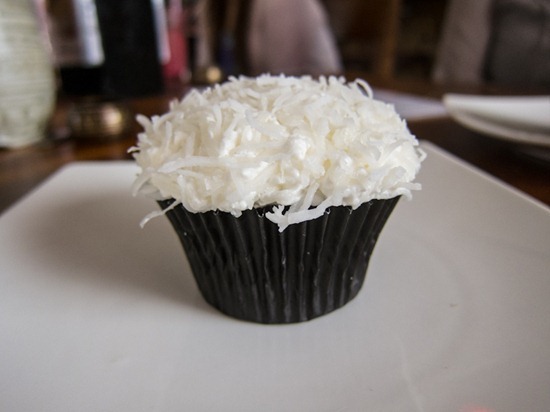 Mmmm…looks delish, especially those vegan cupcakes! My hubby and I are sailors. We bought a 27 ft Catalina last year. It’s a great cruising starter boat, but we got started sailing dinghies. Look for a local sailing club through a local college or university for dinghy sailing (we live in Vancouver and took lessons with the UBC Sailing Club). It’s an incredible way to really learn how to sail a boat (though there is a chance you’ll get wet!). Also, racers are usually always looking for crew on their boat…you’ll be especially sought after if you have any White Sail or Basic Cruising CYA (Canadian Yachting Association) courses under your belt! The regattas usually end up with a dock party and drinks and boaters are a really friendly bunch! Look at bulletin boards at marinas and ask around at boat supply stores. 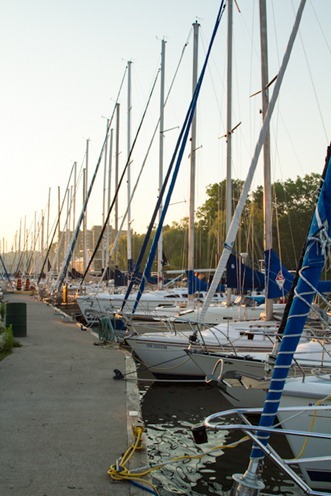 Some yacht clubs will allow people to just hang out at the dock on race day, and they’ll just come and pick you up! My husband and I wish we crewed more often before we had kids because you learn so much…but alas, now we have our own boat (that can sleep our kids in it, which is great!). I would also highly recommend taking a Canadian Power Squadron course to get to know Aids to Navigation and other important boating safety stuff (if you take a CPS course, you will also get your Pleasure Craft Operator Card). Thank you so much Shelley for all the great info! Taking notes :) It sounds like you have found something you love. Good for you! Wow Angela! 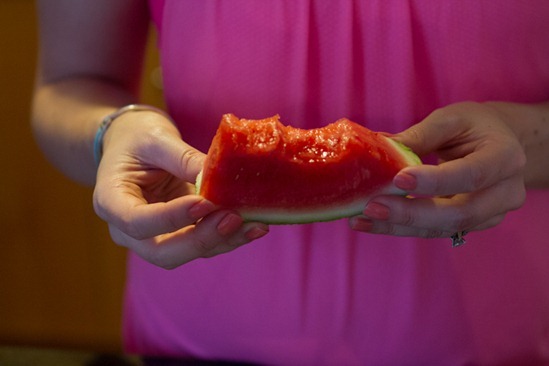 I love raw food when it’s done correctly and by these pictures, I’m in shock! I love the color and care in the presentation, so beautiful! I was also blown away by the presentation too! I’m up for joining a running group and meeting you and new people! I know no-one in the area currently, and can’t wait to meet new ones. This weekend is a race, but hopefully next weekend I can join you! Oh I wish I lived in Canada! I have no blogger friends to meet with here in Philly…or real friends yet but I’m sure that will change hopefully! That food looks utterly amazing. Oh my gosh. It makes me want a veggie burger at 9 am. I did a sailing camp when I was little and I’m sure there are places where you can rent sail boats! Hi Angela! That’s so weird, my boyfriend and I were just at the Naked Sprout yesterday! We really liked it, but they were unfortunately sold out of key lime pie. :( I would definitely be interested in future meet ups, so please add me to the list! I hear that key lime pie is amazing. I will add you to the list, looking forward to meeting you sometime! I have been meaning to try that place. It is just 10 minutes from me too and my acupuncturist was always telling me about it. I will definitely have to check it out now. Looks good! Everything looks delicious but those cupcakes are calling my name! That food looks absolutely delicious! You’re blog has definitely convinced me that vegan food can and is delicious! I’ve tried quite a few of your recipes, and they’ve been amazing! Oh my gosh, if you grace us readers with a recipe for those raw bread sticks I will kiss your feet. They look fab! As does that taco salad – can’t wait for that post! I love hearing about vegan restaurants in other places! If you’re ever in Williamsburg, Brooklyn come meet me at Foodswings! It’s a vegan fast food joint – meaning, okay, it’s not the healthiest of vegan restaurants. But their “metal fries” with hot sauce and fake bleu cheese are so good that eating them, for me, is on the same plane as a religious experience. haha that sounds like a can’t miss dining experience! I have a feeling I would love this place!! Sailing always intrigues me! I so admire anyone who can make traditionally cooked meals raw and make them delicious! I’m not quite there yet, but I like a mix of raw and cooked so that’s okay by me. I e-mailed you a while ago about joining a running group and I’m still interested :). Ok, 12 things: First off, what on Earth is “massaged kale” like seriously…never heard of it. 2nd, that taco salad looks awesome!!! What are the giant crispy thingys? 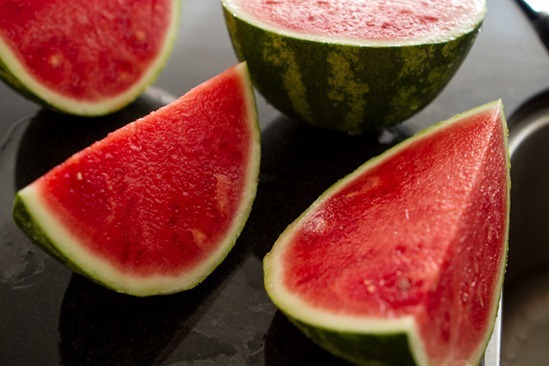 And #12…where did you find watermelon that gorgeous?!? I live IN THE SOUTH and haven’t seen watermelon that beautiful around here yet! J.E.A.L.O.U.S. Now I’m on a mission to find it! Please email us today – We have a little something for you and hope to see you again real soon. I’ve only been sailing a few times but absolutely love it! SO peaceful, yet beautiful :) The college I go to even has a sailing team, but I don’t quite think I have that sort of skill haha! Thanks again for organizing the meet up. I had a great time and can’t wait to try a group run with you all. What a perfect weekend! 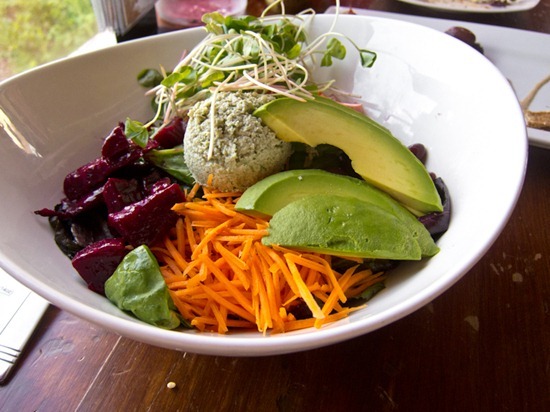 I’m so incredibly jealous of how close you are to these fabulous places… the nearest raw/vegan restaurant to me is 120+ minutes away, are crazy expensive, and only okay taste-wise. Also, I would love to go jogging with you! Wish I lived in Canada, haha! I love your blog and have found great info and inspiration during my own quest for a healthier diet & life. 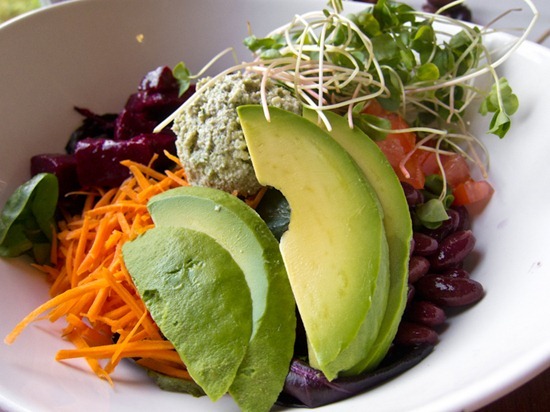 I actually live in Burlington, just a couple of blocks away from the Naked Sprout – my favourite restaurant, and within walking distance, the perfect combination! I would love to be included in future meetups in the area or at the Naked Sprout – please count me in! Great to know about a vegan restaurant in Burlington. We often pass through there on our way to visit family in Hamilton and area. Now I know where to stop! Any advice on how to sprout sunflower seeds? Sunflower sprouts are my absolute favorites! Hi Angela. I live in Oakville as well and would love to be put on the email list for future meet ups! Thanks, will do. :) We are thinking of taking some lessons too. We shall see! please add me to the mailing list for future meet-ups! My friends took me here for my birthday as well! The cupcakes and raw taco are amazing! We haven’t in a long time, but I will certainly add you to the email list! I’m hoping to organize something when my manuscript is done and things die down on my end a bit. Talk to you soon! I just went to the Naked Sprout yesterday and it was amazing. I know I’m a bit late on this post but can you add me to your meet up list? Thanks! Aww that’s too bad! :( Sorry to hear it.